That’s the question on my mind since I started self-publishing ebooks about a year ago. Falling ebook prices and rising number of cheap reads—an increasing number of them serials built around single characters—offer readers bountiful choices. What’s good for consumers may not be best for producers, though. If 99 cents is the value of all books, who can make a living writing them? The answer to that question makes Amazon the savior of publishing or the great Satan destroying it. I write about this today because overnight Amazon sent long email “Important Kindle request” announcing Readers United. But the letter didn’t come to me as a reader but as an author, from Kindle Direct Publishing. 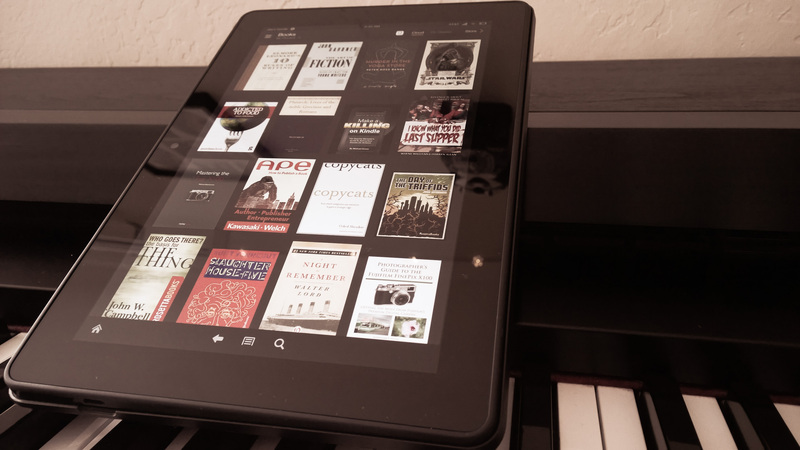 Amazon and publisher Hachette are engaged in a dispute that, long-term, could affect future ebook pricing. Hachette Authors United seeks resolution from Amazon, which calls on readers—and writers—to respond in kind. We call on Amazon to resolve its dispute with Hachette without further hurting authors and without blocking or otherwise delaying the sale of books to its customers. We respectfully ask you, our loyal readers, to email Jeff Bezos, CEO and founder of Amazon, at jeff@amazon.com, and tell him what you think. He says he genuinely welcomes hearing from his customers and claims to read all emails at that account. We hope that, writers and readers together, we will be able to change his mind. We will never give up our fight for reasonable e-book prices. We know making books more affordable is good for book culture. We’d like your help. Please email Hachette and copy us. Hachette CEO, Michael Pietsch: Michael.Pietsch@hbgusa.com. Copy us at: readers-united@amazon.com. The one letter is signed by beaucoup writers and the other by the “Amazon Books Team”. Both sides would like you to believe there is right and wrong here. As a journalist I always ask first: “Who benefits?” Amazon and Hachette each seek benefits that aren’t necessarily mutually exclusive but do evoke monopoly muscling—Hachette belonging to the old publishing cartel and Amazon emerging as the newer incarnation. The Internet retailer wants to own the new market, and low-pricing drives epublishing platform adoption, while Hachette seeks to preserve the status quo. I’m of mixed mind as an author but delighted as a reader. Amazon deserves sole credit for ebook’s success as a product category. Microsoft Reader led the first big ebook push at the turn of the century, and Barnes & Noble launched its original ebookstore using the software. I bought my first ebooks there about 14 years ago. But by late 2003, it was over; Barnes & Noble gave up on ebooks—a market later re-entered only after Amazon’s Kindle success. In news stories for CNET during ebook’s early days and writings as an analyst mid-decade last, I criticized the publishing cartel for holding back the new market. Ebooks came with onerous digital rights management that restricted usage common with print—little things like sharing books among family members—and they were priced the same as hardcovers. Publishers sought to protect print margins by making readers pay the same price for digital as ink-and-paper editions, or more. Retailers typically discount new titles by 40 percent, while ebooks sold for list price. No wonder Barnes & Noble closed up shop in about three years. Then along came Amazon, with the first Kindle Reader, and lower pricing. To get there, the retailer sold many titles at a loss, which got prices below $9.99. But as Kindle adoption grew, the US Justice Department chased five major publishers (and Apple) for ebook price fixing, and self-publishers propagated, Amazon prices plummeted. Now the effective, perceptive cost is free for people paying $9.99 a month for Kindle Unlimited. Can authors sustain a living? I certainly can’t, but others make magic and perhaps I just need to learn how. I decided to write books because people pay for them, unlike the stories I write online. I blame the Google-free economy for undermining paid content’s value. Paid as in someone receives a salary for producing the stuff. But falling ebook prices undermine books’ value, too. Conceptually. That’s where as a struggling author I side with Amazon. Value is arbitrary. If someone wants something enough, they will pay for it. You have to make it valuable to them. Publishers like Hachette, and the authors it represents, want to assign monetary value. Amazon’s model empowers authors and readers to set value. Yes, selling a book for 10 bucks is tougher when one-thousand others sell for one dollar. Conceptually. If the pricier title is valuable enough to readers X, Y, or Z, they will pay. Or maybe one-thousand people will buy at a buck when only five would pay 10. In the lower-cost scenario Amazon pays the writer $350 and $3.50 in the other. My books are now all available exclusively through Amazon, which is required for them to be available through Kindle Unlimited. I’ve chosen my monopoly. Perhaps my feelings would be different if Hachette, or any other publisher, banged on my door begging to publish one of my books and offering fat advance. My challenge remains: Writing something people will pay for, or at least take for perceptually free as part of Kindle Unlimited. Amazon compensates me either way. I wonder how other authors will respond to Amazon’s Readers United.